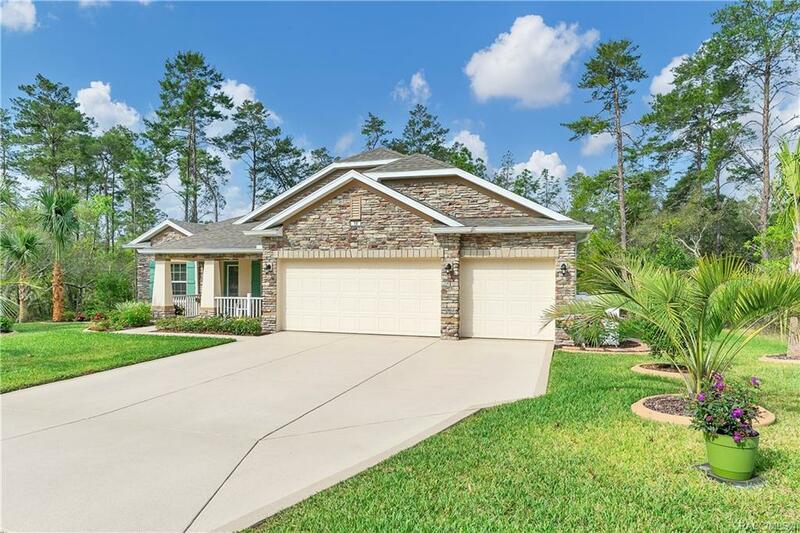 This 4 bedroom 3 bath home in Sugarmill Woods Oak Village is one of the nicest homes I have ever listed. It is actually better than having the same home built new. The owners have completely redone the landscaping (several Palm Trees and added Flower beds), screened in the porch, added stone to the entire from of the home, put a separate AC unit and tiled the floor in the 3 car garage for his workshop. For energy saving items, the owner has added dual pane argon filled windows, radiant barrier and extra insulation, & LED lights. For the interior, the kitchen cabinets and appliances are the builders premium upgrade with dual wall ovens, glass top stove and granite counters...crown molding throughout the home. A Lease back until April 2020 is an option but not mandatory. All Furniture is negotiable. This home will not last. Directions: Us 98 To North On Lone Pine, To Left On Palm Grass Ct. Home In Cul De Sac.